The Ministry called a meeting last week for all the national park coordinators of the certified national park product programme. The meeting was held in the Őrség National Park on the other side of the country along the Slovenian and Austrian borders, about an 8-hour drive for us. Before setting out, Zsolt suggested we stop for lunch at a langos place in Sajoszentpéter he had heard good things about. We have yet to find langos anywhere in the country that compares to our Saturday langos at the Hunyadi tér market in Budapest, but we are always willing to try another. I was very surprised to find that Sajoszentpéter is not a village, an impression I had from passing through it on route 27, but a city if you enter by route 26 towards Banréve. We will definitely have to go back to explore. In fact, there are several langos places in town, but the one to aim for is at a big crossroads on the right in a wooden shack at Kossuth Lajos u. 209. They offer a wide range of normal and stuffed langos. The customer in front of me asked for less cheese - how often does that happen? Must be a good sign. I had the traditional cheese-sour cream langos while Zsolt had a stuffed langos with chicken meat. When I received my huge langos, I was asked to put on my own garlic, then she took it back and gave me a choice of either smoked or normal cheese which she then grated on fresh. She put the sour cream on with a paint brush. Definitely worth a return trip! The route through the Őrség was marked by a distinct change to more sandy soil, pine trees, immaculate bike paths lined by artistically pruned bushes, and an overall sense of orderliness. We stayed in a modern youth hostel in Őriszentpéter by the church and local market (held on Saturdays). I would recommend that the managers install reading lamps by the beds and a place to hang clothes in the rooms and hang towels and clothes in the showers. Otherwise it was very comfortable, especially the beds. For some reason both Zsolt and I were hankering for a pizza, so after Albert our organiser arrived with some házi palinka, we walked down a nature trail through a park and to the Zala Parti Betérő Pizzéria. My cheese pizza was very good, and the beer went down just fine after such a long drive. Our colleagues from the Bükk National Park joined us later in the evening. The next morning we had breakfast at the Pityerszeri Csarda in Szalafő. Besides the restaurant, there is an orchard, open-air museum, outdoor ceramic kiln, bread oven, shop for local products and other buildings. We would return there for dinner the following evening. Of particular note here and throughout the park is the thought that has been given to welcoming the visually impaired. Most of the signs and nature trail signs are also in Braille. In addition, solar powered map boards have an audio function. The model of the open-air museum, also for the visually impaired was occupied by a cat for much of the morning. Our first visit to a certified product/service was the Slovene Model Farm in Felsőszölnök. The village is the westernmost in Hungary, and as such, also has the two most geographically western pubs in the country. Andrea welcomed us with delicious 100% apple juice from their press and ransom cream on bread. Lunch was a mushroom ragout (champignons/portobellos, ceps/porcini and chanterelles) with pumpkin seed rice. While chanterelles are known as "fox mushrooms" in Hungary and alternatively "chicken mushrooms" in Borsod County, they are known as "nyulica" or "bunny mushrooms" in the Őrseg. After lunch we visited their apple juice "workshop" where area farmers can press their apples and package their own apple juice for sale at local markets or for personal use. Plans are also being made to produce cider in the near future. While the apple juice is organic and local, the packaging is in non-refillable bag-in-boxes. I hope they can get the required permits for refillable or at least recyclable glass bottles in the future. The guest rooms are clean, modern and beautiful. It would be nice to see some paintings, photos, or works of art to warm up the rooms. Andrea was friendly, professional and knowledgeable - I am sure this farseeing venture will be very successful. The next stop was to the national park certified Kétvölgy Guesthouse in Kétvölgy. 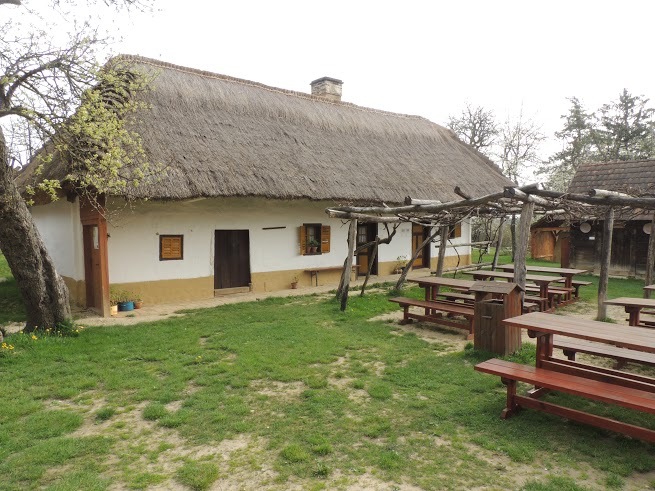 Hungarian Slovenes are known as the Vend, and one of their 300 year old peasant houses can be found on the grounds. The first thing I noticed about this odd structure has a wooden chimney emerging from a thatched roof! Luckily only cold smoke emerges from the chimney. I liked the kitchen the best, along with the paintings of various plants and herbs by Ilona Zeke-Hajas lining the wall leading up the spiral staircase to the guestrooms. The quince palinka went down smoothly. The guesthouse has also received the full 4 sunflower rating by the Village and Agro-tourism Association. They could consider installing energy efficient light bulbs. The day was not nearly done. We visited Orfalu next ,where we met Csilla Gyenes and Gyula Galambos, proprietors of the national park certified Vadvirág Apiary and Herb Garden. These folks have plans and plans, matched only by their enthusiasm and positive thinking. On offer are walks through the orchard, in the grass-among the trees medicine tours, the secret life of bees tour, wild plant culinary walks and cooking classes, and God's pharmacy and smallholder workshops. Their plans include api tourism (bee tourism), which has become extremely popular in neighbouring Slovenia. They will construct a medical apiary house where guests can breathe the propolis rich hive air, or relax to the soothing buzzing that is said to help alleviate stress, depression and headaches. There is a 100 year old apple tree at the heart of the 3.5 hectare holding that the couple comes out to stroke at least once a day. The chicken coop is constructed beside the pig sty because they have found that foxes avoid the smell of pigs. The couple makes a number of jams and honey products including plum and grape jams, and 100% chestnut cream which they say tastes like Nutella. We tasted 6-8 honeys, my favourite being the forest pine honeydew honey, closely followed by the propolis honey. They will hold a free open day on April 23, 9:00-16:00. The last stop of the day was the Balogh Family Pumpkin Oil Press in Szalafó. If I had known I would be in the Őrség two weeks ago I would not have ordered pumpkin seed oil through Albert from the Balogh Family but would have bought some personally. The family also makes walnut, hemp, grape seed, poppy seed, rosehip and hazelnut oils. They use the leftovers from the pressing to make snacks, flours, creams and salad oils. 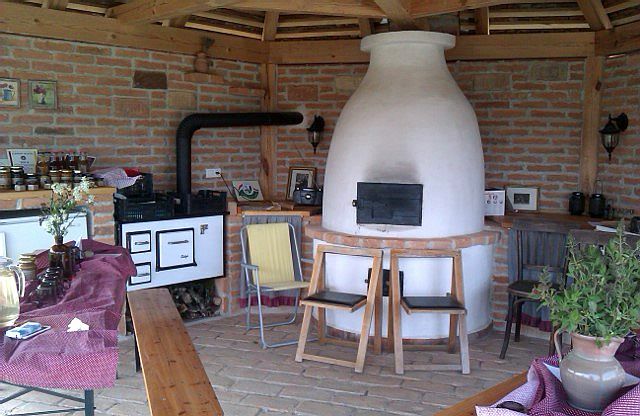 Next to the press building is a room housing the most enormous burgundy coloured tile stove occupying the entire wall and consisting of three ovens and a stove top. We were treated to several types of homemade strudel. The pumpkin-poppy seed strudel I tried was delicious. Pumpkin seed oil, among other things, is very helpful in preventing prostate problems and I take a teaspoon a day. I have always been curious (and outraged) by the exorbitant cost of domestic pumpkin seed oil. I was in the Mediterranica Olive Oil Shop a few weeks ago in Budapest where I could buy a litre of any one of the five best olive oils in the world for less than the cost of a litre of domestic pumpkin seed oil. I am talking about non-organic, non-imported, normal pumpkin seed oil. Olive trees take many years to grow large enough to produce, while after one crop of pumpkins you save the seeds and just replant every year. I asked Mr. Balogh why this is, prefacing my question by saying this was not an attack and I was asking in general, not about their business in particular. I just wanted to understand. All he could say was that olive oil and pumpkin seed oil are different. So, I am still ignorant. We returned to the Pityerszeri Csarda for dinner under the stars serenaded by an accordion player. My dinner was fried cheese with dödelle or gánica, a traditional Hungarian potato dish. Fit to burst after being constantly fed all day, Albert still had a surprise course for us of homemade Őrseg pretzels which we all took home with us. The next morning and early afternoon was taken up with planning to revamp the certified national park products webpage. We went to the Bognár Restaurant in Őriszentpéter for lunch. Somehow the waiter/manager understood the gluten-free menu request, but was incapable of understanding vegetarian. The gluten-free folks would get vegetable soup and everyone else meat soup. When asked about this, he answered that there was no problem because there was no meat in the meat soup. No problem except for all those who expected meat in their meat soup and vegetarians who expected vegetable soup. Hmmmm. Albert successfully lobbied for a change in plan, but perhaps the vegetarians would have been better off with the meat soup - the vegetable soup was too salty to eat. The fried cheese was also forgettable. Strangley, the owner of this restaurant is the same as that of the very good pizzeria we visited on our first evening. This said, it was the only negative experience of the entire trip which was very well planned and full of interesting programmes and people. 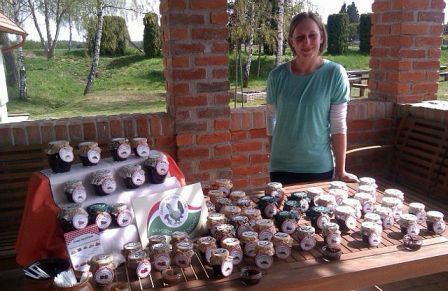 The last excursion was to the Peat Bog Visitors Centre where we were greeted by a selection of Viktoria Kovács' jams. I would suggest in the future such tastings do not involve 100 small plastic spoons one must toss out after tasting each jam. Instead, one metal spoon in each jar to spread on some small biscuits would be the more environmentally-friendly option. Viktoria had a number of interesting and tasty flavours, my favourite being apple jam with vanilla and cardamom. We then went on a walk along the elevated nature path that winds through a section of the peat bog. All in all it was a very pleasant and well-organised trip,full of positive thinking and energetic people. and I am already planning ways to get back to the area and explore the area by bike. Thanks to Gizella Janó from the Körös-Maros Nemzeti Park for some of the photos.